Once iTunes is open and you’re on Chatting with the Experts page, click the “Ratings and Reviews” tab. Click here to go to Chatting with the Experts page on Stitcher. Scroll down to where it says “ Show Ratings and Reviews”. Click the “Write a Review” button and write a paragraph or more about what you love about the podcast,and encourage others to listen as well. 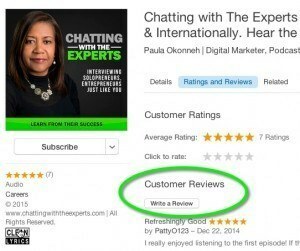 These three simple steps will help others know how easy it is to give reviews on a non- iTunes device.